Established in the year, 2006, we, 'Vinayakashot Private Limited', are counted as a prominent Manufacturer, Trader(In local), Supplier ,Exporter and Importer of a comprehensive range of Cut Wire Shot,Stainless Steel Balls and Stainless Steel Fibers etc. Our products are Manufactured by using finest quality raw material and sophisticated technology. These products are appreciated for their durability, low maintenance. Our products find application in industrial sectors for various purposes. Being one of the well known names in this industry, we also offer customized products to our clients that suit their specific needs & requirements. Owing to our state-of-the-art infrastructure and experienced workforce, we are able to manufacture products that are capable of rendering enhanced performance and usage. Our professionals play a vital role in delivering quality product line at cost-effective prices to the clients. Further, they make sure that the products are dispatched within the stipulated time frame to the clients to gain their maximum satisfaction. With the support of our committed team members, we have been able to establish a huge client base across the Indian Subcontinent. Under the able guidance of our technical & professional team,Vinayakashot Private Limited have been able to attain consistent growth in this field.Our team's profound knowledge and wide industrial experience have helped us becoming the foremost choice our clients. Shot peening is a cold working process that is used for developing a compressive layer and helps in modifying the mechanical properties of a metal. 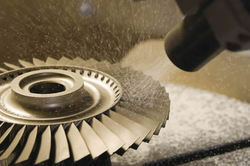 We use shot peening media as a tool to operate on this technology. It should be spherical and broken and uneven particle of this media that produce harmful effects. The media must possess hardness in the part that is used for peening and should also be conditioned to the limited size, thus preventing the reduction of compressive residual stress. Moreover, these shot peening media should be dry, clean, and free from dust to reduce the damping effect and compressive residual stress. Furthermore, it also helps in preventing the depth of compressive stress layer & unacceptable contamination. Supported by in-depth experience of our professionals, we have emerged as a proficient manufacturer, supplier and exporter of Cut Wire Shot,Stainless Steel Balls and Stainless Steel Fibers etc. Our products are highly appreciated in the international market for their unmatched quality, reliability and performance.